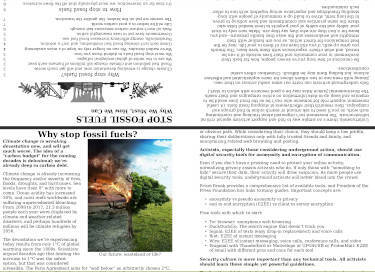 Please help disseminate our analysis by downloading, printing, and distributing material. 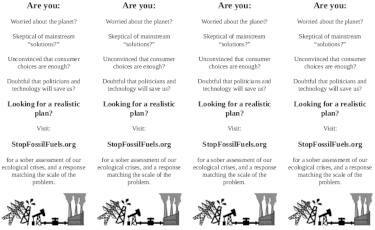 Help “advertise” Stop Fossil Fuels at your local library and bookstore, by printing and inserting these bookmarks into books about our environment and collective future. 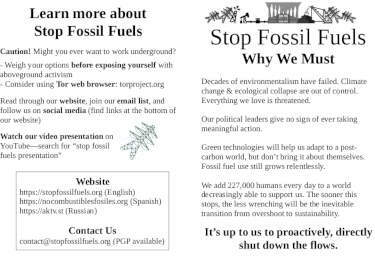 Single page, double sided black and white basic introduction to Stop Fossil Fuels and strategy & tactics. Print, cut in half, and fold in half. Optionally: trim extraneous blank margins to give it a more balanced feel. 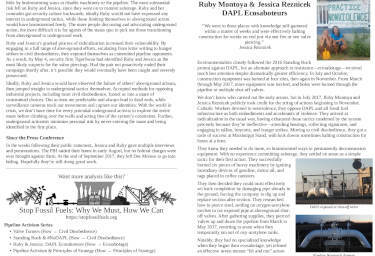 Single page, double sided pamphlet with the content of our Ruby Montoya & Jessica Reznicek: DAPL Ecosaboteurs page. Print, then fold in half. 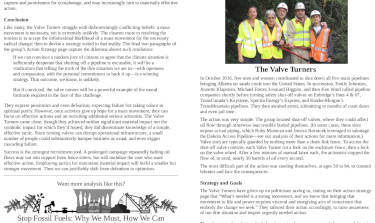 Single page, double sided pamphlet with the content of our Valve Turners page. Pages are arranged for you to print two-sided, then fold in half to create a zine. Print page 1, then print page 2 on the back of page 1. Pay attention to orientation so pages aren’t upside down. Repeat for the rest of the document. Some printers may have functionality to print it all correctly, automatically. Consider supporting our work by joining our mailing list, sharing & "liking" this page, and following us on social media.